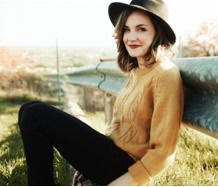 NASHVILLE, TENN – Jesus Culture worship leader Kristene DiMarco is set to release her new worship album, Mighty, on July 31. Recorded live earlier this year in Redding, CA, Mighty is DiMarco’s first album release with Jesus Culture Music’s partnership with Capitol Christian Music Group. Featuring 11 original worship songs, Mighty showcases DiMarco’s songwriting, which comes from a place that carries the message of hope, trust, and the power of God through all circumstances. With each song inspired by her admiration of hymns, DiMarco combines string melodies, a choir, and her passionate lyrics to create her most powerful worship album to date. DiMarco has been featured on Jesus Culture’s album Awakening: Live From Chicago, as well as releasing her own music Those Who Dream (2008) and Safe Place (2012). DiMarco wrote and performed “It Is Well,” which was featured on Billboard’s Top 50 Hot Christian Songs chart.